Who knew I could do enough book and bloggy things in one month to warrant an update? September was a challenging month. Henry went through pink eye, thrush, teething, and colds. He still doesn’t sleep at night. Or ever. But, I feel like I’m getting back into a groove. My commitment to read every day helps a lot. There were a few days where it didn’t happen, but usually, if I tell myself “just one sentence,” I’ll end up reading a few pages. I may never be as prolific a reader and blogger as most, but this feels good. I got books! And things! 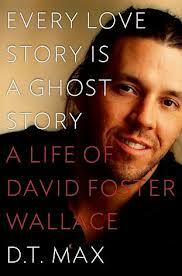 Won: Every Love Story is a Ghost Story by DT Max, a biography of the late David Foster Wallace. The Edmonton Journal’s book columnist Michael Hingston (@mhingston) had an extra copy to give away and I entered on a whim; I’ve never read any of DFW’s work. I was going to jump right in with Infinite Jest, but Michael suggested I start with something a little less ambitious, like Consider the Lobster. “Considering” that Infinite Jest is more than a thousand pages long, I think I’ll take that suggestion. Check out Michael’s blog for lots of local literary goodness. Bought: Infinite Jest by David Foster Wallace. This might just be the longest book I’ve ever attempted. Eek. Bought: Love in the Time of Cholera. See my rant about the cover here. Gifted: A brand new, pink Kobo Glo. It’s great! Mostly. Review to come. I read books! Yes, plural, BOOKS. Vineland by Thomas Pynchon – I wrote up my initial thoughts on this excellent book. Four stars, nearly five. From Away by Michelle Ferguson – Review soon. Interesting themes but the characters didn’t come alive for me. Three stars. I did things on other blogs! I guest blogged on Reading in Winter. Check out my post on Paranormal in Classic Literature. What a great experience. Kristilyn even helped me with the final touches as I was in the middle of sleep hell with my seven month old. I created my Classics Club list! Now I just have to actually join. I figure it’ll be book snob central – so excited. I committed to do a guest post for Angry Vegan in October. It’s not a book blog, so I’ll have to come up with something a little different. Here’s a guest post I did last year about my week-long vegan challenge failure. Here’s to an even more productive October. And hopefully some sleep. Yay for a new Kobo! And a pink one! Hope October is good to you! Look at you go! 🙂 I’m looking forward to your review on From Away. I really enjoyed your post on the Angry Vegan’s blog (your sister, right?). I got The Kind Diet for Christmas a few years ago, but actually started reading it (cover to cover) back in the spring. I read a few pages here and there, as I’m actually interested in the information in her book, but I haven’t gotten around to trying any of the recipes yet. And: YAY! New kobo! I haven’t even seen the new one’s yet as I don’t go back to the book store until tomorrow. I think From Away will be my next post. Hopefully over the weekend. Yep, AV is my sister. You should follow her, she’s doing a post a day for October “Vegan Month of Food!” I have a small collection of vegan cookbooks. We probably eat vegan once per week, sometimes more. I like it, you have to be a little more creative since you can’t fall back on meat-potato-vegetable. The Kobo is good, though I’m finding the touch screen sort of unresponsive, sometimes I have to tap it a few times to get it to go.But it’s million times faster than the old one, thank god! !